Blasted Bioinformatics!? : Is IonTorrent open or not? Is IonTorrent open or not? It seems IonTorrent are trying to present themselves as the open democratising sequencing platform for high throughput sequencing, with their Ion Community, sample datasets and (in theory) open source software. That sounds great and much more open than Roche 454 or Illumina, but I don't think they're doing a very good job of it - apparently they're even managing to break the GPL (see below). Update 23 Jan: As planned, the Ion Torrent Suite is on GitHub under the GPL v2. Nice! If you go to the IonTorrent website, there is is a bright orange top level tab "Community", which now (as of some time in the last few months) has an encouraging link "Download Sample Data" and "Download Source Code" which take you off-site to some 3rd party domain. Quite why IonTorrent are not hosting this under IonTorrent.com puzzles me, I don't know or care who Jive Software are, but why give them free advertising and handicap search engines? 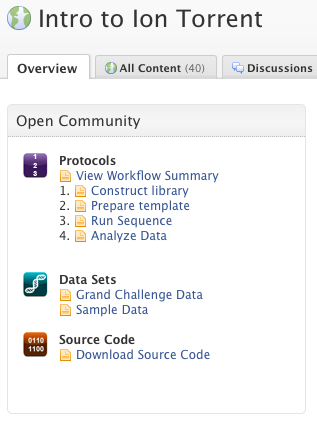 The not-open-really Ion Torrent Community, screenshot taken 12 Dec 2011. Anyway, then the trouble starts. Three months ago that community page was a complete dead end unless you registered. Now, you and get a look at a little bit of content - even some discussion threads. 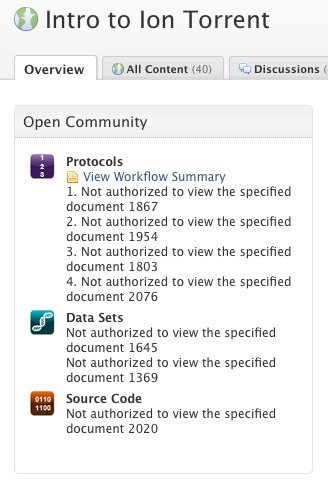 However, everything under "Data Sets" and "Source Code" says "Not authorized to view the specified document". The box heading is "Open Community" for bonus irony. So, despite those encouraging links on the main website, the "Community" pages don't appear to have any public datasets or source code. If you want to see more, you have to register with the site, give them your email address, and agree to a non-disclosure agreement (NDA). I declined as a matter of principle. That and the fact I don't have any IonTorrent data that needs analysing yet. I applaud Mike for openly engaging on a technical blog like this (although it turns out this was an imposter - see end of post), but I think IonTorrent had better have another word with their Lawyers - not just for handicapping IonTorrent's openness drive, but to clarify their advice: As spotted by James Casbon (@casualbon on Twitter), you can't release GPL code under a NDA (Richard Stallman says so, and it is even in the GPL FAQ). I do hope that this is a temporary glitch and that IonTorrent are in the process of opening up their source code - at least to the point that it can just be downloaded under the GPL v2 and used without any additional requirements. They would then have a better claim to be democratising DNA sequencing, compared to the closed-source black box software provided by some of their rivals. In IonTorrent's shoes I would also aim to release lots of sample data with no strings attached (public domain or CC0 would be fine). Why? To make it as easy as possible for scientists and programs around the world to test their software with IonTorrent's data, and thus support it well. That would be a key factor for selling their machines. If they don't do it, other people will - but IonTorrent won't get the brownie points. Consider the high profile Open-Source genomic analysis of shiga-toxin-producing E. coli O104:H4 paper in the NEJM about the 2011 E. coli outbreak in Germany, which was based on the BGI releasing raw IonTorrent data to the world, then assembled with MIRA 3 and annotated by volunteers (see Nick Loman's original blog post, EHEC Genome Assembly, and the EHEC wiki). I note this paper features prominently on the IonTorrent website as some good publicity. Update 13 Dec: As per the second comment below, and confirmed by email, those quotes about the NDA were from a Mike Lelivelt imposter. Not knowing him personally, the imposter presented a believable if slightly outrageous director, and that probably coloured the tone of my blog post. My apologies to the real Mike for being taken in - but I stand by my view that as long as IonTorrent hide their code and sample data behind a NDA, they are wasting the chance to demonstrate real openness. For example, Roche 454 have an access agreement to see the "Newbler" source code, but because it isn't open I still regard their code as a black box. I hope IonTorrent will take the small step of making their software suite freely downloadable under the GPL without the NDA. Interesting read and thanks for the mentions :) Hopefully they take some of your feedback on board and move towards a more open model. I guess something like this has not being done before in BioTech (perhaps I'm wrong) and I guess it takes time or perhaps there are people in LifeTech that are still holding on to the past similar to the dinosaurs in the Movie and Music industry. Peter - The comments you are quoting from me were posted by an anonymous third party using my name. They are not an accurate reflection of the Ion Torrent position. They were posted prior to Monkel Lek having correct authentication mechanism in place. I'm happy to have this conversation without anonymous individuals posting using my name. It's great to hear that those comments weren't an accurate reflection of your views. Could you please then state, here or on your forums or on your website, that the source code is *not* Restricted Content under the site terms and therefore available under the GPL v2 as stated. I'm really pleased you've used a GPL to license your code, but I want to be careful not to violate the terms I signed up to. James - I've replied to your thread on the ion community. We will be editing the ion community T&Cs to clarify that the source code is indeed open source. Also we will be releasing the source code associated with Torrent Suite v2 on github in January. I hope this clarifies our position.